Here in Cleveland, we definitely have our share of harsh winter weather. If you live in a snow-inclined place, be sure to keep any sidewalks in front of your building free from snow and ice. Some cities may charge fines for unshoveled sidewalks. It may your responsibility as the property owner to keep publicly accessible thoroughfares clear. If you do not live close enough to your property, you can hire a service to clear off the driveway and sidewalks whenever it snows. Damage from flooding can cost hundreds or thousands of dollars to repair. Install a sump pump in all of your properties to remove excess water and protect from flooding. This is especially vital if your property is in an easily floodable, low area. The roof is the first-line of defense from outside elements. Therefore, it’s important to keep your roof in good condition to protect from rain, snow, or hail. If you notice any interior leaking, it may be a sign of a potential problem on your roof. Address those issues immediately. A small roof repair will be much cheaper than extensive water damage. Gutters may be easily forgotten about because they aren’t very visible. However, clogged gutters can cause significant water damage to your home. Regularly clean out your gutters so that they drain properly. You can hire a company that specializes in gutter cleaning, or do it yourself with a gutter cleaning tool. You can also take some preventative measures by installing a gutter guard. It may be an investment, but gutter guards can help you keep debris out. During the winter months, you will also want to check gutters for ice dams. It may be tempting to save on the electricity bill and skip heating or cooling your home, but doing so might cause damage. During the winter, keep the temperature set to at least 55 degrees to prevent the pipes from freezing and bursting. During the summer, set your air conditioning to at least 85 degrees or else your building may incur humidity and mold damage. A backup generator as an emergency system may be a good idea. You can also cycle the lights throughout the building so that it seems as though people are moving around. One method is to leave the first-floor blinds closed, so no one can see in, while higher blinds remain open. This will give the impression that residents are upstairs. If your property is unoccupied for a longer period of time, change something small but visible. Hang something in a window or put up a lawn decoration. If you or your neighbors have an extra car, you can park it in the driveway to make it seem like people are home. Your insurance company may consider a vacant home a liability. As a result, you’ll want to contact your insurance company to find out if your coverage changed. Ask about specific policies. Some insurance companies offer “Vandalism and Malicious Mischief Coverage” that can further protect your home. Of course, the best way to spot signs of trouble is to go and visit the property. Drop by at different times so no one can notice a pattern. On each visit, check for signs of forced entry, broken windows etc. on both the inside and outside. Especially make sure that your window latches, door latches, and other locks are secured. If you live far away from the property or can’t make regular visits, ask a neighbor or a friend to drop by. Or, you can even hire a service to do interior and exterior checks while you’re away. Alert your local police department that your home is vacant. Provide a list of names of anyone who’s authorized to be on your property. Also, make sure that they have your contact number and the information of a local contact if you can’t be there. While this can’t guarantee the safety of your home, you’ll at least definitely be contacted if something happens. Contact your building’s utility provider and ask to be notified of any odd spikes in power or water usage. This can alert you if anyone may be squatting or otherwise using your home. Your neighbors may be able to help you keep a watch on your building, especially if there’s a Neighborhood Watch. Give them your contact information and ask them to call if they see any suspicious behavior. They may also be able to pick up any deliveries to the home for you. Also, as mentioned above, you can ask your neighbor to park an extra car in your driveway. Of course, a security system is a great way to safeguard a vacant property. However, we understand that property managers and owners may be on a budget, or only expect their property to be on the market for a short time. In that case, these 5 tips can help protect your property from damage and unwanted visitors. Enjoyed this article? Be sure to share us on your social media to spread the information to your property management friends and coworkers. 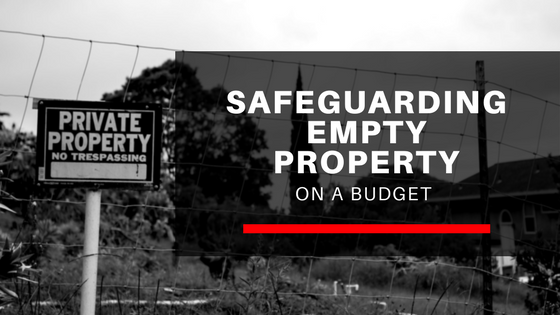 Have any other methods you’ve used to keep your vacant property safe? Tell us in the comments below!